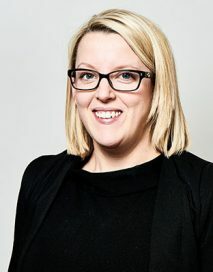 Kate is a specialist family practitioner, experienced in matrimonial finance and cohabitation disputes and private law children matters. Praised for her thorough and considered client service, Kate is an incisive advocate with a measured and robust approach. She is able to carefully construct complex arguments and she always communicates her client’s case clearly and effectively. Kate acts for parents, extended family, and children’s guardians in private law disputes. Kate has experience of complex cases including: removal from the jurisdiction and internal relocation, implacable hostility to contact, fabricated and induced illness, allegations of sexual abuse and domestic abuse. Kate regularly acts in financial remedy proceedings, representing clients at all stages of proceedings. Kate is also available to provide written advice prior to issue. Kate has experience of high net worth cases, family businesses, significant pensions, and cases involving extensive financial conduct and disclosure issues. In addition to matrimonial finance applications, Kate accepts instructions in TOLATA claims and claims under Schedule 1 of the Children Act 1989.